Father and son in the dock. 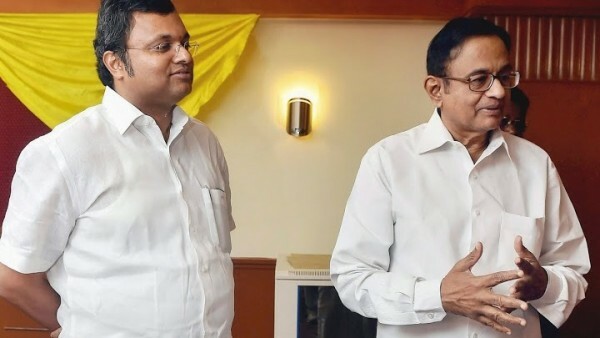 The Enforcement Directorate has attached properties worth Rs 54 crore belonging to former Union Finance Minister P. Chidambaram's son Karti Chidambaram and a firm in connection with the INX media money laundering case. Karti Chidambram described the agency’s move as “bizarre and outlandish” and said he would take legal action against it. The properties include a cottage worth Rs 8.67 crore in the UK’s Somerset, a tennis club and land located in Spain’s Gava worth Rs 14 crore. Besides the foreign properties, the ED also attached land and properties worth Rs 16 crore in New Delhi’s Jor Bagh (Karti’s mother Nalini Chidambaram is a 50 per cent stakeholder in it), two bungalows in Tamil Nadu’s Ooty – one worth Rs 50 lakh and another Rs 3.75 crore – besides an agricultural land worth Rs 25 lakh in Kodaikanal in Tamil Nadu. Fixed Deposits belonging to the firm Advantage Strategic Consulting Pvt Ltd (ASCPL) worth Rs 90 lakh kept in a Chennai bank were also attached. The assets are in the name of Karti Chidambaram and ASCPL, the firm allegedly linked to him. The ED has also attached properties belonging to Peter and Indrani Mukerjea in connection with the same case. The properties were attached under the section of Prevention of Money Laundering Act (PMLA). Karti tweeted: “A bizarre and outlandish provisional attachment order which is not based on law or facts but on crazy conjectures. “This is meant only to grab headlines. The order will not withstand judicial scrutiny, review or appeal. Will approach the appropriate legal forum,” he said. Karti is facing probes by the ED and the Central Bureau of Investigation (CBI) in several cases including alleged irregularities in the Foreign Investment Promotion Board (FIPB) clearance to then INX Media for FDI in 2007 and the Aircel-Maxis case in 2006 and a money laundering case. The ED and the CBI are probing how Karti Chidambaram managed to get clearance from the FIPB when his father was in office.